El Mundo Deportivo: David Luiz delivered a message via his agent to Barcelona that he would like to join the club. The Spanish champions will offer €35 million for the defender. The Catalonian ‘Sport’ estimates that a deal will be done this week, with David Luiz, Daniel Agger and Jan Vertonghen as the finale candidates for Barcelona’s defender position. 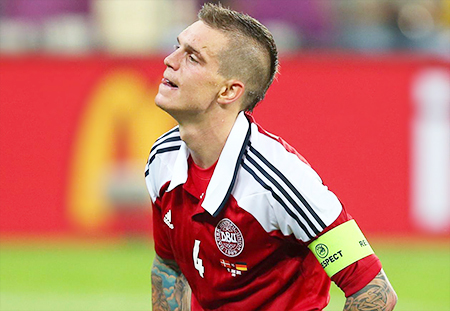 Daniel Agger’s agent declares today: “Liverpool rejected Barcelona’s bid. Daniel has a 3 year contract with Liverpool, if he transfers, it will be only after the clubs agree on a fitting transfer fee”. The British Independent dropped a bomb tonight when publishing Manchester United might steal Gareth Bale from Real Madrid in case the deal with Tottenham fails. The report also states that Tottenham is getting frustrated with the negotiations with Real Madrid. More from Liverpool: Ajax confirms getting bids for the Dutch Toby Alderweireld. “We have received offers”, confirmed manager Marc Overmars, “but I will not say who they were from”. Liverpool is also interested in signing Granada’s defender, Guilherme Siqueira, before the season starts, as claimed by the Liverpool Echo. Sky Sports reports this morning that Liverpool’s Stewart Downing will go through physical inspection in Westham. The president of Estudiantes de La Plata confirmed that the club accepted a bid by Queens Park Rangers for Colombian striker Duván Zapata, who’s also wanted by Westham. Italian media reports that Napoli and Inter are in a race for Cameroonian striker, Samuel Eto’o’s signature. The players’ agent said: “A transfer to Napoli will be a dream, we have no contract with them, but if he will be released from Anzhi Makhachkala that’s where he’d like to go”. Livorno is demanding answers from Inter about striker Samuele Longo, with whom they reached an agreement lately.